BAGRS members (l to r): Glen Simpson, Larry Silverman, Richard Johnson, Jerry Fogel, Nancy Norris. We set up the Roving Garden Railroad for a two day show at the PCR convention in Dublin April 5 and6. Leandro Historical Railway Society, recently fabricated two special hinges for the upper loop's front bridge. Now when the bridge is lowered the tracks will align without having to use a hex-driver wrench because the hinge point is higher than the rails. Rails snap into "bridge joiners". The photo (lower right area) shows where the left-side gate needs a bit more scenery, maybe mine portals. The suspension bridge has lights you could install on the other side. Little signs are made and need posts. Figures need nails in their legs to hold them up. During the month of January, we will meet at the home of Nancy Norris and Ron Gies to fine tune some areas of the traveling trailer. We will meet every Wednesday, January 9, 16, 23, 30 and, if necessary, on February 6, starting at 10AM. Our goal would be to make repairs and improvements plus modifications to make the trailer easier and faster to set up and take down. There’s a new tarp to be installed on the front gate. Some scenery needs touch ups. The skirts need paint. One of the buildings needs its roof repaired – you know -- normal garden railway maintenance. Please consider helping one day or more. Moe’s building an electrical panel and it would be great for somebody to install a few animated scenes with kits we already have on hand. If you’d like to be on the email list, call Nancy at 925-408-9402 or email nunorris@aol.com to get the address. And yes, there is a free lunch. Let's get it ready for the annual meeting and two big conventions this spring. The ROVING GARDEN RAILWAY had a wonderful experience at KidFest in Concord this past weekend. Organizers estimated 20,000 tickets were collected. People drove from over 2 hours away to attend an event just for kids. Many local organizations set up bean-toss and similar booths to entertain kids and inform the public about their non-profit cause. The stage had non-stop children groups performing dance, music and martial arts. When I walked around the booths I almost choked up a bit to see all the wholesome activities set up for children to experience and especially to participate in. It was not uncommon to have thirty people at a time watching the trains and chatting with our volunteers around the railroad. Thanks to Seth Abraham we had stanchions around the layout so we could relax a bit. Like clockwork, our three trains ran constantly,except while batteries were being replaced, which was an attraction in itself. We estimate handing out 200 BAGRS postcards after chatting with the prospects about our club. Many thought it was a good deal to become members in order to bring their families on the monthly tours. On Friday, my husband Ron and I set up the trailer. All day Saturday we had new member, Gerry Fogle, and "old" members, Terry Hurley, Ron Gies and I along with my sister Barbara. On Sunday, Joe Barker, Terry, and I along with new member, Jack Reichert held down the fort. We didn't have enough volunteers to show on Monday. Maybe next year. (Upper left photo) Ron Gies' gift of a Ragtime bellows whistle on top of our sign attracted fair goers and our poster had helpful info. (Upper right photo) Stanchions helped keep the kids back but we had our share of leaners! Wouldn't it be delightful if everyone sent a drawing with their thank you notes? 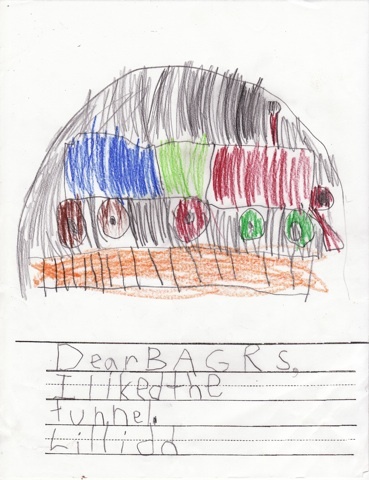 Well, that's what we received from the third graders in Linda Herbert's class in Montara. 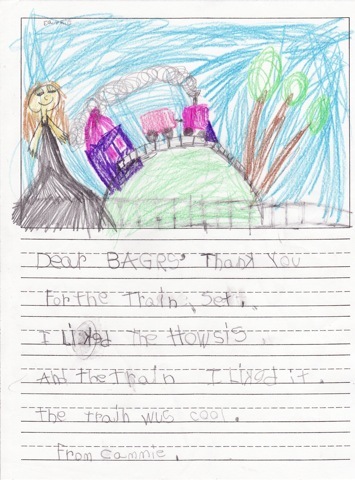 These beautifully illustrated expressions of gratitude show us just what part of the Roving Garden Railroad each child focused on - at least for their picture. It was hard to narrow down the pile to just five letters to share here. I'll start with my favorite - Lillian's simply stated, "I liked the tunnel" made me feel our efforts in that department have been appreciated. Ava and Turner especially liked the "wod r fol", but also colored in many other elements of the layout. I think Ava really captured the mountains, as well as her fellow students smiling beside the railroad. Or do they represent the four boxcar children? Many kids made reference to the book, The Boxcar Children, which they read prior to our displaying the Roving Garden Railroad with its miniature scenes from their book. 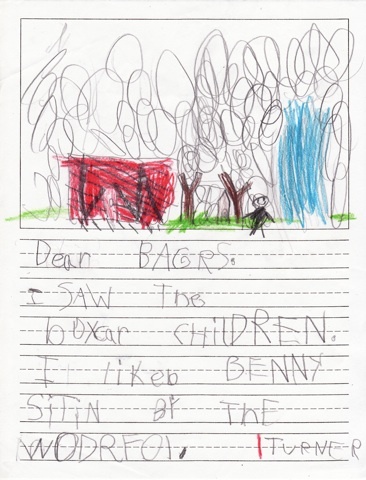 Turner drew a picture of the youngest boxcar sibling, Benny, sitting by the waterfall (wod r fol) that helped the children survive in their boxcar home. Cammie seems to understand the scale nature of the railway, as she drew herself much bigger than the trees - with a big smile, too. Most of the kids represented the tracks in their pictures. After all, railroads and their importance in moving freight and passengers across our country were the focus of their classroom for Continents Day, the big event that BAGRS helped to celebrate. 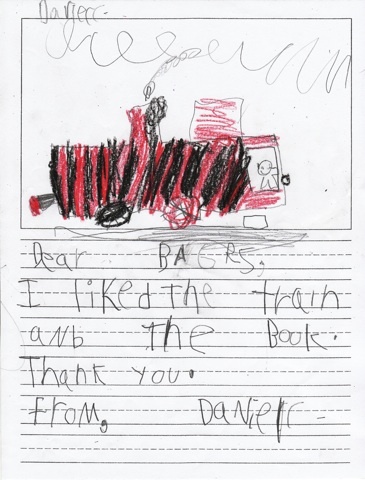 Daniel's primary concern was a detailed black and red locomotive driven by a happy engineer. He liked the book, too - and thanked us. Well done, BAGRS! Kids, we appreciate your lovely thank yous! On November 19, four BAGRS members ran trains on the Roving Garden Railway for Montara's Farralone View Elementary School, less than a mile from the ocean. BAGRS member, Linda Herbert, organized our participation in the event through her school, as she is one of the teachers in this beautiful seaside community. Every year Farralone View hosts "Continent Day", a semi-public event in which parents are invited to participate. All morning the children take their home-made "passports" from room to room and get them stamped while they visit each display and take part in hands-on activities teaching about the continent of the year: this year was North America. To celebrate the railroads' history of connecting North Americans, Linda Herbert's classroom was decorated with memorabilia about trains and kids could operate trains on the floor. Just outside her room a chalked-in track led to BAGRS' display in the school's courtyard. In the above photo, Linda Herbert and Frank Lucas watch children watch trains. 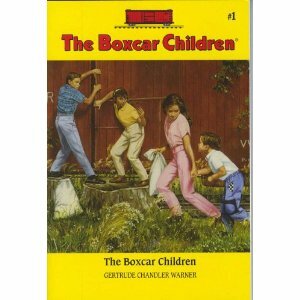 In preparation for the Roving Garden Railway, grades 1, 2 and 3 read the book, The Boxcar Children, by Gertrude Chandler Warner, a story about orphaned siblings living on their own in an abandoned boxcar. It's also told in 3-D on the train layout. Numbered signs and a scavenger-hunt styled handout gave kids the fun of finding the story among the buildings, rolling stock and live scenery. One girl, left, points at Watch, the runaway dog, which she spies in the doctor's garden where cherry trees grow. Most kids just wanted to watch the trains go around or run alongside. When it came time to set up or take down the trailer, parents and custodians helped make the job easier. Recent alterations by Joe Barker and Bill Mead made at a work party were immensely helpful, too. Every little bit helps. Thanks for all your help, BAGRS members. Not shown, but helping with answering questions from children were Edward van Pelt and Terry Hurley. Nancy Norris is about to back up her truck to the buttoned-up trailer, shown ready for hook up. Imagine you’re back in third grade and you’re reading The Boxcar Children with everyone else, even the lower and upper grades. Questions arise about the four homeless kids no one knows in the depression-era, one-horse town. Town folk assume they took the train into town. In the first chapter we find they’re hiding out because they want to stay together. Soon they find an abandoned boxcar and begin an adventure of resourcefulness and fun amid the day-to-day needs of staying warm, fed and healthy. Then you find out that the story of The Boxcar Children is modeled on a Roving Garden Railroad and it’s coming to school after everyone has read the book! There will be a newspaper, just like in the old days, to help you find the story on the model railroad. Best of all, real model trains run around the countryside of real little trees and a real waterfall. BAGRS member and Montara teacher, Linda Herbert, has arranged it all. Now imagine you’re able to help set up the Roving Garden Railroad and watch the expressions on the kids faces as they figure out the scavenger hunt and try to see where the mine train goes after it’s inside the tunnel. Don’t you want to know how the story ends? 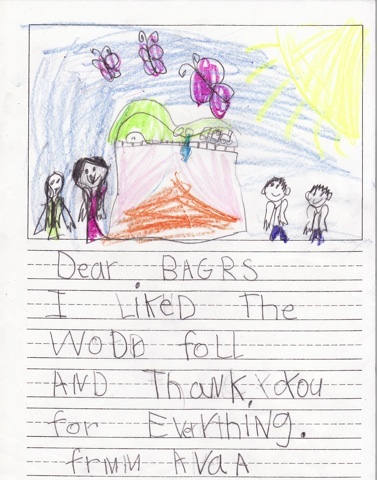 Dads and moms will want to know what BAGRS is. Yes, you are needed to help finish some scenes with figures and signs. And you are needed to help put together a two-page newspaper. The school is in Montara, CA, just south of Pacifica and 2 miles north of Half Moon Bay airport. The date is early Friday, November 18, 2011. You’re all welcome to help with a pre set-up work party at my house. Call or email for date and time. We will accommodate if you need a weekend party.